In December, I bought a beautiful woodblock print in a Kyoto crafts store for my stepmother and her husband as a New Year’s gift. The print, a temple landscape reflected in a pool of water, is defined by its use of subtle gradations of greys and blacks, with a sudden spot of red, like a robin in February, that stands in sharp contrast to the monochromatic landscape. 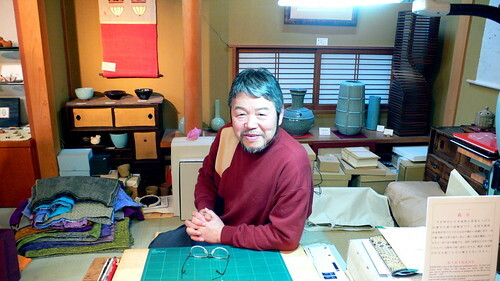 In March, while following the Philosopher’s Walk, Lea, Michelle, and I happened to walk right into the shop that’s run by Sadao Uetani, the woodblock artist himself. Uetani introduced himself while I was busy admiring the woodblock prints and showing Lea and Michelle the one that I had bought for Cecily and Alec. He was an incredibly nice guy and he and his wife brought out tea and cakes for us while we looked at the rest of the work on display. Lea ended up with a beautiful celadon-blue vase made in Arita. If you want to find Uetani’s shop, it’s about halfway along the Philosopher’s Walk and you can spot it by the four chairs out front that are carved directly out of tree trunks.